This beautiful flowering Native perennial provides an abundance of radiant fuchsia flowers from July till Autumn. 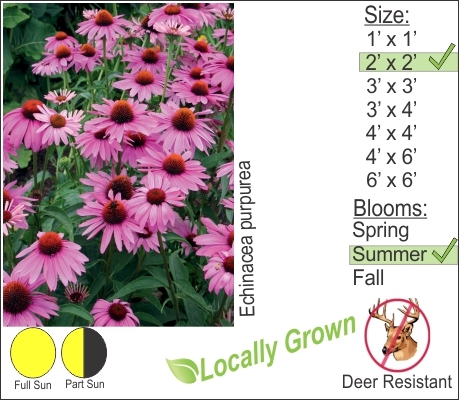 Echinacea is considered deer resistant in the Hudson Valley but you will need to protect young plants while they are rooting in and getting started. Deer will occasional graze and pull on the purple cone flower. Its more out of curiosity rather than actual grazing that the deer will chew on this plant. They eat a few flowers as well but typically leave the rest of the plant alone. You can place some netting on small young plants and when you have an established mature clump they will be fine on their own. Like the vast majority of flowering perennials, Purple Cone Flower require organic well drained soil to flourish.